Archaeological excavations in Burnt City led to the discovery of 5000-year-old twin graves in this historical site. Tehran, 15 December 2005 (CHN) -- For the first time, a grave in which two twins were buried was unearthed during archaeological excavations in the historical site of Burnt City. 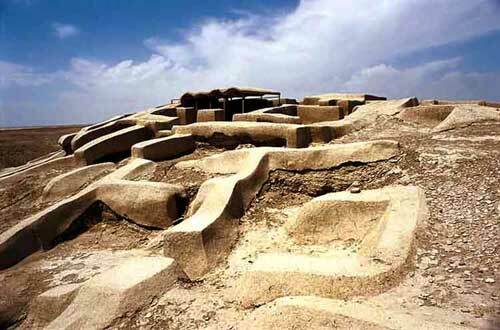 Burnt City historical site, situated in Sistan va Baluchistan province in southeast of Iran, is one of the most important pre-historic sites of the country. Eight seasons of archaeological excavations in the site indicate that Burnt City was an important center of civilization and trade some 5000 years ago. Burnt City is regarded as a crucial historical site in the eastern Iranian plateau. �During the latest excavations in this historical site, we were able to unearth several historical graves and to discover the skeleton remains of infant twins who were buried alongside each other,� said Farzad Forouzanfar, an anthropologist of the Archeological Research Center of Iran. �The evidence indicates that most probably the two infants were twins. Since the infants are still in a foetal position, they must have been immature babies, died before their birth,� added Forouzanfar. The twins are buried in a joint grave, and their sexuality is not clear yet. According to Forouzanfar, this is the first time the archaeologists have faced such a case. Archeologists are determined to carry out excavations in a 1000 square meter area of the central part of the cemetery in this historical site during the 9th season of excavations in Burnt City. Eight seasons of excavations in the historical site of Burnt City resulted in findings of more than 500 historical graves, which had never happened before in any of the historical sites of Iran. The oldest backgammon in the world along with 60 pieces has been unearthed beneath the rubbles of the legendary Burnt City in Sistan-Baluchistan province, southeastern Iran. Iranian archeologists working on the relics of the 5,000-year-old civilization argue this backgammon is much older than the one already discovered in Mesopotamia and their evidence is strong enough to claim the board game was first played in the Burnt City and then transferred to other civilizations. "The backgammon reveals intriguing clues to the lifestyle of those people," said Mansour Sajjadi, head of the research team. "The board is rectangular and made of ebony, which did not grow in Sistan and merchants used to import it from India." He added the board features an engraved serpent coiling around itself for 20 times, thus producing 20 slots for the game, more affectionately known in Persian as Nard. The engraving, artistically done, indicates artisans in the Burnt City were masters of the craft. "The 60 pieces were also unearthed inside a terracotta vessel beside the board. They were made of common stones quarried in the city, including agate and turquoise," Sajjadi added. Experts still wonder why they played the game with 60 pieces and are trying to discern its rules, but it at least shows it is 100-200 years older than the one discovered in Mesopotamia. They are also intrigued that inhabitants of ancient civilizations, widely believed to be concerned with their daily survival, could afford to indulge in such luxuries as playing board games. The first intact personal insignia was unearthed in the satellite hilltops of the mysterious Burnt City, in the eastern Iranian province of Sistan-Baluchestan. �The insignia is made of a river pebble and its color is blackish gray. It is believed it used to belong to a distinguished inhabitant of the city,� said Tahereh Shahraki, member of excavation team in the historical site, dating 5,000 years. It seems the owner used the insignia to add his seal on high-value documents. Hassan Sargazi, director of the Cultural Heritage Organization in the province, noted the owner must have applied the seal to indicate his lofty status in the society. Archeologists are now working on the design of the insignia, which in some places appear to be symmetrical, but they are absolutely certain it belongs to the Burnt City, most probably annihilated in a massive fire. Other experts guess the change in the course of Hirmand River could account for the inhabitants� migration, leaving the city vulnerable to natural elements. Earlier this year, archeologists had discovered some insignias, strikingly, in the grave of women of the ancient city. Experts believe that the discovery of a large number of seals and calculation devices in the site proves that it was, in addition to being a religious place, used as a center for economic activities. The 5,000-years-old history of the Burnt City makes it one of the largest and most ancient sites in the Middle East. Various industrial and residential units, as well as cemeteries and monumental relics litter its 151 hectares of land. Signs of civilization, first laid down in the Burnt City in 3200 B.C., remained intact up to the years 2100-2000 B.C. and during four successive periods in history. One of the prominent relics found in the Burnt City is a skull that according to the anthropological studies, is the first evidence of brain surgeries in prehistoric Persia. LONDON, November 23 (IranMania) - The archaeological international conference of the Burnt City will be held in Zabol University in Sistan-va-Baluchistan province by the attendance of Iranologists and other interdisciplinary sciences experts from Iran and European countries, said CHN. Burnt City is one of the most important historical sites of Iran. Eight seasons of archaeological excavations in the site indicate that Burnt City was an important center of civilization and trade in its own time. Burnt City is being regarded as a crucial historical site of the eastern Iran plateau. ?Some of the most well-known interdisciplinary sciences figures, who are carrying out archaeological excavations alongside the Iranian team, will deliver lectures in the conference,? said Mansour Sajadi, head of the archaeological excavation team of the Burnt City. University professors and archeologists from France and Britain will also give lectures on the Burnt City during the conference. ?Since vast anthropological studies have been carried out on the Burnt City so far, most of the researchers will deliver their lectures in this respect,? said Sajadi. Eight seasons of excavations in the historical site of Burnt City led to studies on more than 500 historical graves, which had never before been carried out in any of the historical sites of Iran. An Italian team was also supposed to be part of the archaeological team of the Burnt City, but due to some delays in issuing the visa they did not come to Iran. Some issues such as archeobotany and paleopathology were duo to be discussed by the Italian team in the conference. The one-day conference will be held on 23rd of November 2005 in Zabol University of Sistan-va Balushistan province. Burnt City is one of the key historical sites of Iran, located in the southeastern province of Sistan va Baluchestan, which has so far hosted eight archaeological seasons after the Islamic Revolution of 1979, revealing the area to have had functioned as an important trade center some 5000 years ago.